LG 34UM79M is the world's first Chromecast-enabled multimedia monitor. Already an industry leader renowned for integrating cutting-edge technology into its premium, high-resolution monitors, LG Electronics (LG) is pushing the industry to the next level with plans to introduce Chromecast-enabled 34UM79M monitor at the 2017 Consumer Electronics Show (CES) in Las Vegas next month. At CES 2017, LG will be showcasing the 34-inch 21:9 UltraWide Mobile+ Monitor (model 34UM79M). 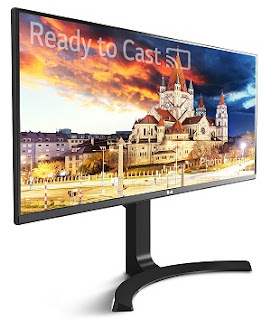 The 34UM79M is the world's first Chromecast-enabled multimedia monitor, allowing users to seamlessly stream their favorite movies, music, games and more from mobile devices directly to the monitor. And LG's UltraWide monitor allows owners to simultaneously multitask between the PC and the mobile device using a single screen. Similarly, the Dual Controller Plus feature allows users to control both a PC and a smartphone/tablet via a single keyboard and mouse. What's more, the LG Mobile+ Monitor application allows for the control of many of the monitor's settings such as input, volume, aspect ratio, PBP/PIP, etc. remotely and conveniently. Visitors to CES can see LG's newest advanced monitors for themselves in the Las Vegas Convention Center Booth #11100, Central Hall.